This photograph has been scaled down; full resolution photograph is available here (740 by 585 pixels). Shoho was commissioned in 1941 she could only carry (30) aircraft. At Coral Sea, Shoho had in her Air Group. (8) Zero Fighters (Zeke) (4) Type 96 Carrier Fighters (Claude) (6) Type 97 Carrier Attack Planes (Kate) Shoho was sunk and took as many as (13) bomb hits, and (7) torpedo hits also lost was her entire air group. Hosho was Japan's first Aircraft Carrier and gained experience and training developing her Naval aviation. 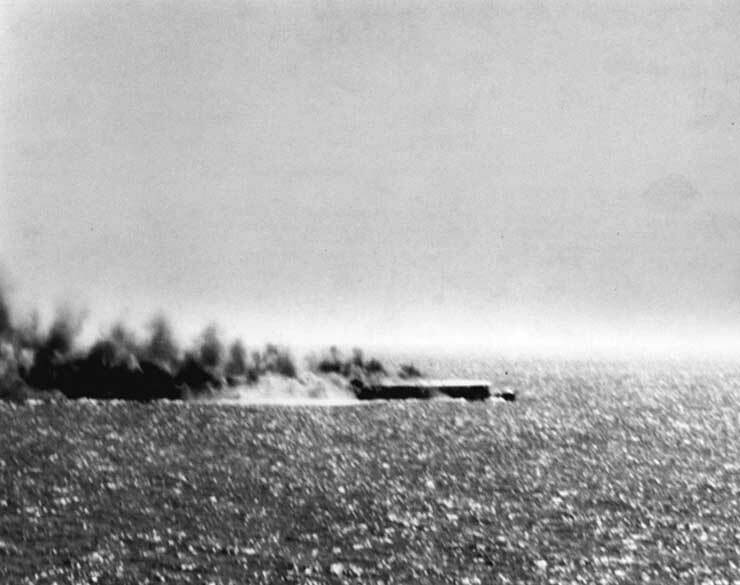 She was the first Major Japanese ship lost during the Battle of the Coral Sea on May 8,1942. "Scratch one Flattop" Radio message sent by Lt. Commander Robert Dixon, leader of the Lexingtons-based dive bombers, that sent Hosho to the bottom.